The EPOS2 P 24/5 is a freely programmable positioning controller, now available from Maxon Motor Australia . The programming of applications of the programmable positioning controllers comply with the IEC 61131-3 standard. The integrated power stage is based on the EPOS2 slave version. These programmable positioning controllers are suitable for brushless and brushed DC motors with incremental encoder and up to 120 watt output power. The already known characteristics of EPOS P 24/5 can also be found in the new EPOS2 P 24/5. This with the subtle distinction of further improved properties and a USB Port as additional communication interface. As a novelty the EPOS2 P 24/5 can communicate with a superior process level for supervisory control and data acquisition. Full backward compatibility – both, in regard to electrical and mechanical aspects – towards EPOS P 24/5 programmable positioning controllers permit alternative employment. Apart from identical dimensions and mounting hole pattern also the connections are pin-compatible. Alike, an existing EPOS P 24/5 IEC-61131 program can be downloaded into the new EPOS2 P 24/5 programmable positioning controllers by using the EPOS Studio. With self-compiled programs, the programmable positioning controllers EPOS2 P 24/5 can autonomously control single and multiple axis systems. Via the CAN Bus all axes can be coordinated simultaneously. Thanks to the communication interface to the superior process level, supervisory control and data acquisition via RS232; USB 2.0 or CANopen is now possible. Editors (ST, IL, FBD, LD, SFC) of the powerful “EPOSStudio” tool are available for programming according to IEC 61131-3. The integrated project browser shows all network resources. Complex programs with a large number of decentralized controls can be optimally managed with it. Drive systems are configured and networked quickly using intelligent step-by-step wizards. Supervisory Control- Interface to the superior process level for supervisory control and data acquisition via RS232; USB 2.0 or CANopen (see also appendix 1). Control Data Analyser- The new data recorder implemented in the programming tool OpenPCS 2008 simplifies analysis of chronological sequence of IEC-61131 program variables. Communication- Via CANopen, USB and/or RS232. 32-bit Digital Signal Processor Technology permits outstanding Motion Control functionality. Now, complex mathematic algorithms can be efficiently executed, thus resulting in improved control characteristics. 12-bit Analog Digital Converter Resulting in higher resolution and, as a consequence, in superior quality of analog signal capture. High-speed Motors- EC motors can be operated up to 100 000 rpm in block commutation (1 pole pair). High Resolution Encoder- The maximal encoder resolution of 2 500 000 increments permits the use of high-definition encoders. The maximal encoder input frequency has been increased to 5 MHz, thus permitting high speed operation with high-resolution encoders. Position and Speed control with feed forward- The combination of feedback and feed forward control provides ideal motion behaviour. Feed forward control reduces control error. 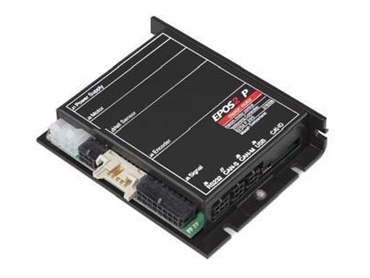 EPOS2 P 24/5 supports feed forward acceleration and speed control. Trigger Output (Position Compare)- Digital outputs of EPOS2 P 24/5 can be configured to emit a digital signal at a pre-set position value. Control of Holding Brakes- The control of the holding brake can be implemented in the device state management. There the time delay for switching on and off can be configured individually. Regulation Tuning Wizard- The upgraded regulation tuning functionality is an effective and time-saving aid for users at start-up, and helps to optimize current, speed and position regulation. This intelligent solution is easy to use and significantly improves the benefits of the positioning control. The redesigned feature Regulation Tuning permits an extremely efficient adjustment of current, velocity or position regulation during commissioning. With EPOS2 P 24/5, EC motors with block commutation of up to 100 000 rpm and 120 watts can be operated. The encoder input offers a resolution of 2 500 000 increments and an input frequency of up to 5MHz. The analog inputs feature 12-bit resolution (that is quadrupled compared to the EPOS P 24/5).